The history of the farmer’s eating habits and diet had to be taken into consideration and questioned. It was found that he had a history of eating raw meat, with frequent consumption of uncooked dog and cow liver. The level of eosinophil cationic protein was 12.50 μg/l and the bronchoalveolar lavage fluid contained 20.8% monocytes, 4.6% neutrophils, 69.4% lymphocytes and 5.2% eosinophils. 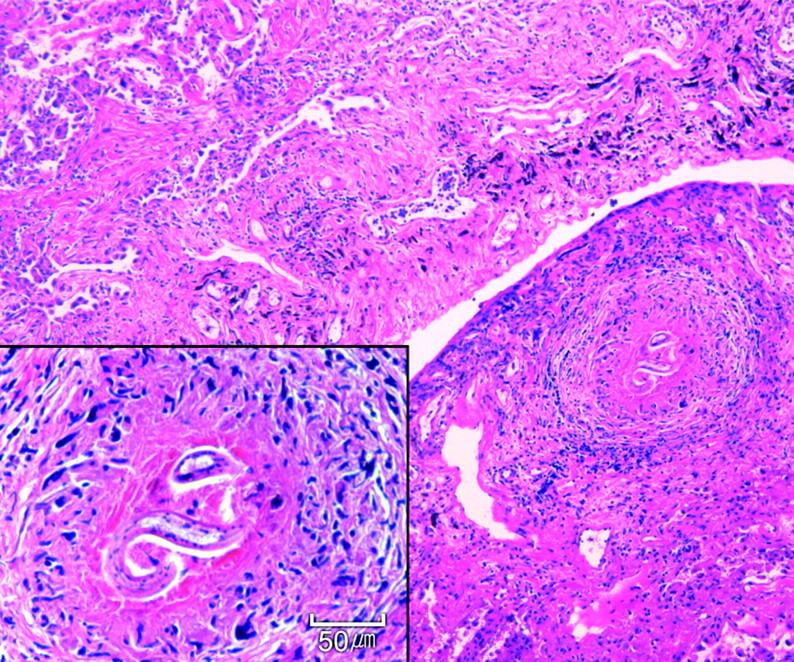 An open lung biopsy revealed extensive eosinophilic infiltration and a larval nematode near the pleural surface (fig 1). An ELISA with the larval excretory–secretory antigen of Toxocara canis was positive. He was treated with albendazole at 13 mg/kg/day (800 mg/day) for 6 weeks. After 6 months, he had improved chest radiographs and no respiratory symptoms. The subpleural granuloma associated with chronic organising pneumonia and a multifocal eosinophilic microabscess reveals Toxocara larva (inset) with a smooth and thin cuticle (scale bar: 50 μm). Human infection by the nematode T canis occurs by ingesting embryonated eggs from the environment or encapsulated larvae from uncooked animal liver.1 In 1952, Beaver et al identified larvae of T canis in a liver biopsy specimen and proposed the term visceral larva migrans (VLM).2 The larvae penetrate the intestinal wall and begin a migration through the tissues. VLM involves several organ systems, such as the liver, lung, skin and, rarely, the central nervous system.3 Since T canis larvae are rarely detected by pathological examination, the most reliable diagnostic method is ELISA with excretory–secretory antigens.4 We believe that this is the first reported case of toxocariasis by direct detection of a Toxocara larva in an adult lung biopsy specimen. Toxocariasis should be considered as a differential diagnosis for adult patients with hypereosinophilic syndrome and a history of eating raw foods.
. Fever, cough, and nodules on ankles. Lancet 1999;354:1872.
. Chronic eosinophilia due to visceral larva migrans; report of three cases. Pediatrics 1952;9:7–19.
. Toxocariasis: clinical aspects, epidemiology, medical ecology, and molecular aspects. Clin Microbiol Rev 2003;16:265–72.
. Immunodiagnosis of toxocarosis in humans: evaluation of a new enzyme-linked immunosorbent assay kit. J Clin Microbiol 1991;29:1831–5.